Apr. 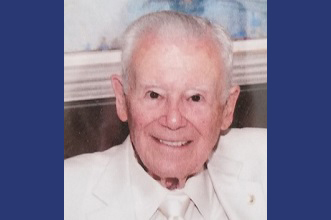 10, 2019: On Sunday, March 31, 2019, Emil Roger "Bud" Annunziato, formerly of Bronxville, NY, loving husband and father of two children, passed away at the age of 95 in Tempe, AZ. Bud was born on July 18, 1923, in New Canaan, CT, to Nemesio and Louise (Jassil) Annunziato. He received his undergraduate degree in 1943 from Niagara University. He was drafted immediately into the Army Air Corps, serving in Guam in the Pacific Theater. He was discharged in 1946. He graduated from New York Law School and received his law degree in 1949. He practiced estate and tax law in New Canaan, New York City, and lastly, in Bronxville. On December 3, 1955, he married Jeannette Quencer Annunziato. They raised two daughters, Gail and Cathy. Bud enjoyed golf, paddle tennis, bowling, bridge, and traveling to all seven continents with his wife. Bud is survived by his wife, Jeannette, daughters, Gail Anthony and Cathy Annunziato, grandchildren, Paige Annunziato and Juliana and Jonathan Anthony, and son-in-law, Jeffrey Anthony, as well as a rescued lab, "Sandy." A memorial service was held on Friday, April 5, 2019, at Friendship Village Skirm Auditorium. Remember him by donation to your favorite charity.